Noah's Ark Centre needs your help! We are constantly seeking sources of funding to support our work offering counselling and debt advice. We know that people in the community, including those who have used our services really value Noah's Ark and the work it does. If you feel able to to make a financial contribution (large or small!) we would be hugely grateful. 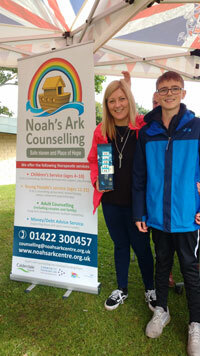 If you are thinking of having a charity event, please consider Noah’s Ark Centre as a beneficiary, so we can continue to provide low-cost counselling and money advice in Calderdale. For a child to attend Rainbows for one term, we ask schools and/or parents to pay £150 per place. Noah’s Ark subsidises each place to keep the costs down, so a donation of £100 will help a child who is experiencing loss to learn to develop trust, express their feelings, be heard and valued and work together as part of a group. You can now donate to Noah's Ark by text! It's so simple and we can even claim Gift Aid on your donation. Text NOAH10 £5 (or however much you want to donate) to 70070. Bags packed with practical gifts for vulnerable clients at Noah's Ark Centre Ovenden have been donated by staff at Lloyds Banking Group in time for Christmas. In addition to the Group’s charitable partnership with Mental health UK, a team based in Halifax also wanted to look closer to home for this season and offer their support. Noah's Ark Money Advice team see over 15 clients each week, local people who are struggling with debt and surviving on very little income. 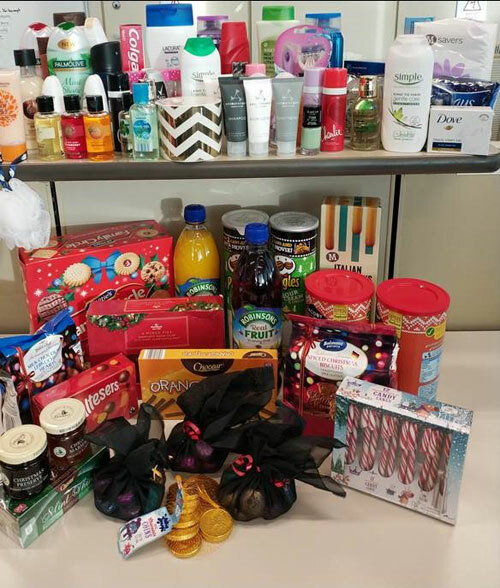 The Halifax team's support and Acts of Random Kindness (A.R.K. ), will make a big difference - their gifts of toiletries, chocolates, biscuits etc., will be given to these vulnerable people to help make their Christmas a better one! Also Marks and Spencers, Halifax gives unsold perishables on a daily basis to the Noah's Ark Centre. The food goes to the New Horizons Cafe at Lee Mount who are connected to the charity who use some of the produce to make stews, pies which are then sold at affordable prices to the local community and groups who use the cafe regularly. Any money raised goes straight back to Noah's Ark to help fund counselling for children, young people and adults in Calderdale. "Support from local people and companies means everything to us. Knowing there are members of the public who care enough to give to us means we can help others so thank you for making a difference and helping us provide a safe haven, a place of hope!" 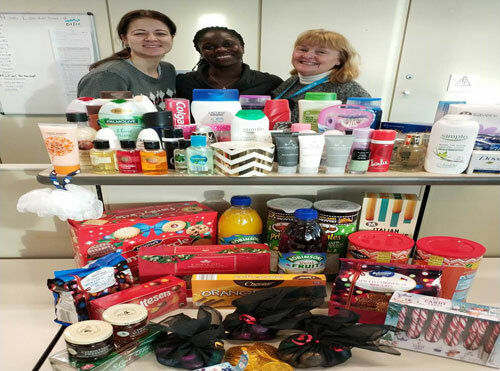 Debbie, Pekwor and Wendy from Lloyds with just a selection of goodies – the black bags contain 12 wrapped chocolates (120 bags have been donated by 1 colleague and his family). Thanks so much to McVities for their fun day in September 2017! We raised over £250 for Noah's Ark. Jenny and Sam won the 1st prize - malt whisky. 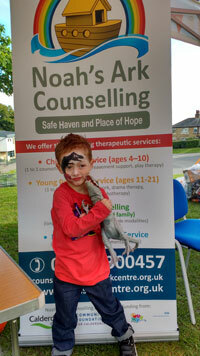 Noah (with the dinosaur) spent lots on the chocolate tombola along with his brother and won lots of prizes! Thanks also to volunteers Katie and Adele who helped run the stall. Thank you to the Mcvities fundraising team for organising the event and the chance to raise such a great amount.